Pop tarts were never a breakfast option when I was growing up. In my family, we had only two choices when it came to breakfast: Cheerios or Grape Nuts. Grape Nuts with their too-crunchy, then too-soggy texture were not an option to my 8-year-old palate. I could stand Cheerios, especially if I added chopped bananas to them. My mother was pretty health conscious, and my dad was a complete health nut. But on more than a few occasions, strawberry pop tarts (with frosting!) made their way into our grocery cart, and ultimately, my belly. 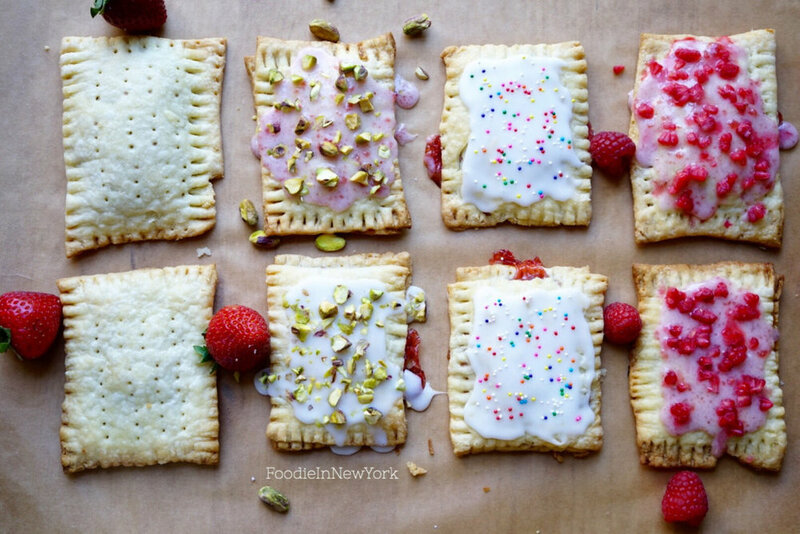 Homemade strawberry pop tarts, complete with frosting and sprinkles. Pop tarts were a special treat, reserved for an after school snack or for sneaking one before Sunday dinner. 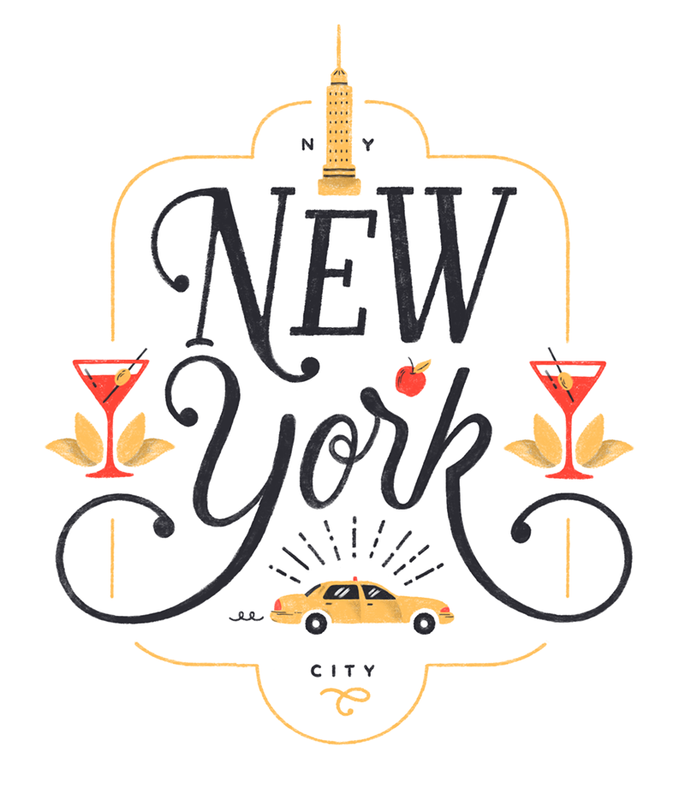 I often find myself nostalgic for these parts of my mostly worry-free, happy childhood. So, I decided to reinvent these and elevate this over-processed, sugary classic to an elegant and sophisticated pastry. Why stop with sprinkles? I added chopped pistachios and chopped raspberries to some. After making these, I realized that "pop tarts" are really just hand pies. Making them isn't as scary as it looks! First, you make pie dough and cut it into rectangles. Next, add filling to half of the rectangles, leaving a little space around the edges. I used a strawberry jam/cornstarch mixture. Add as much as you can because the jam filling can get lost in the thick tart dough. Next, add either water or egg wash to the edges where there is no jam, using a small pastry brush. This will be the "adhesive." Place the remaining rectangles on top of the jam-filled ones. 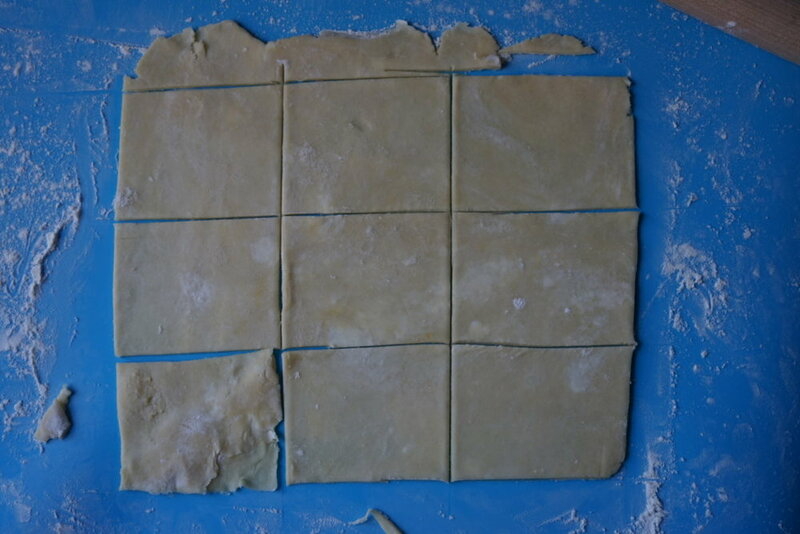 Use the tines of a fork to seal the two rectangles of dough together, just like pie dough. Finally, prick the tops with a fork to ventilate the pastries. Because I live in New York City with no air conditioning and it's hot, I continuously put the dough in the freezer at regular intervals. Before baking, I froze the pastries for about 15 minutes. Finally, I baked them, let them cool on a cooling rack, and they were then ready to eat. I couldn't resist adding toppings to some, which was really gratuitous at this point. I made a simple frosting by combining powdered sugar with a splash of milk. Once the were completely cooled, I smeared icing on some and added sprinkles (for old time's sake). On others, I mixed in a little jam to tint the frosting and added chopped pistachios and chopped raspberries. The frosting I added jam too did not set as completely, so just add a very small amount of jam if you choose this method. Get creative with the fillings and toppings! Use chunky preserves instead of jam. Make it savory by using pesto and sprinkling with cheese and pine nuts! Have fun with it! Whisk flours, sugar and salt together. Using a food processor, or mixer with the paddle attachment, mix in the shortening until crumbly. Mix in the butter until crumbly. Drizzle in the egg and 3 tablespoons of milk and mix until dough comes together. If too dry, add the remaining tablespoon of milk. Divide in half and shape into two 3" by 5" rectangles. Wrap in plastic and refrigerate for 30 minutes, up to two days. Prepare the filling by whisking together the water and cornstarch. In a small sauce pan, add the jam and the cornstarch mixture. Bring to a simmer on low, stirring constantly. Allow to simmer for two minutes. Remove from heat and let cool. 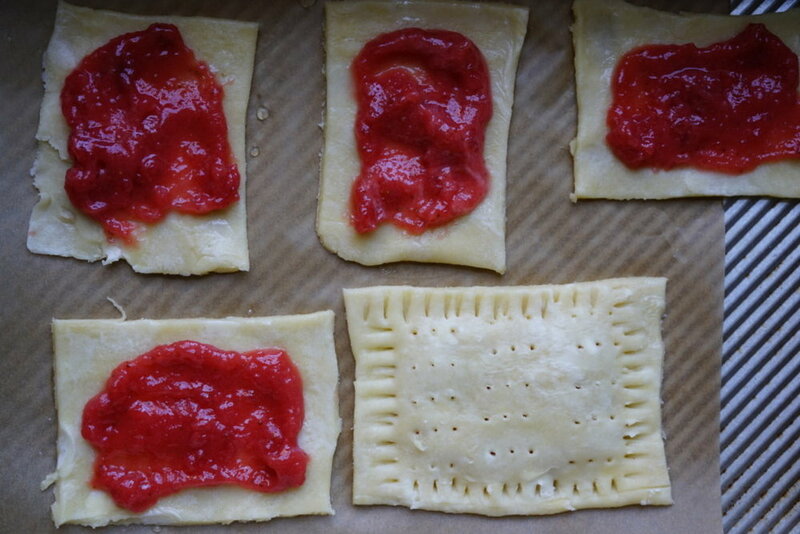 Place the remaining dough rectangles over the jam-filled ones. Use the tines of a fork to press the edges together. Prick the tart all over so that steam can escape during the baking process. Refrigerate the assembled tarts for 30 minutes. Meanwhile, preheat the oven to 350F. Bake the chilled tarts for 25-35 minutes, until golden and starting to brown. Remove from the oven and place the tarts on a cooling rack to cool completely. Combine 1/2 cup powdered sugar with just enough milk so that it combines. Spread the frosting on each tart and top with sprinkles, nuts or fruit. Serve immediately, or may be stored in a closed container for 3 days. *You may freeze the pop tarts and reheat in the toaster if there is no icing. Also, be careful because the filling may start to escape!